Most protein powders contain junk calories. 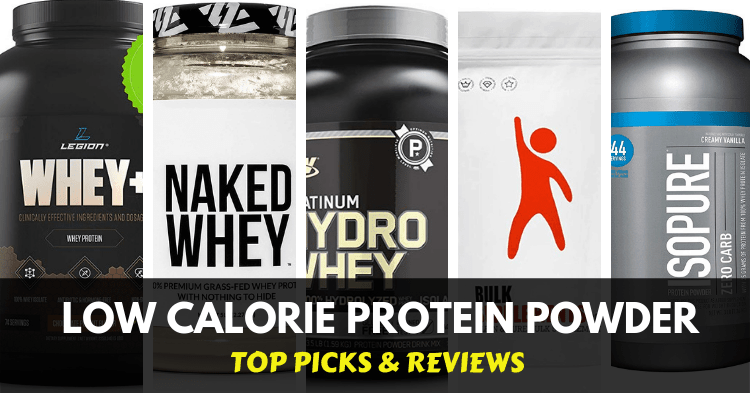 Today we’re helping you avoid wasted money and calories by discussing the best low-calorie protein powders. While protein powders are often associated with massive muscles, they are also useful for losing weight. Dietary protein aids fat loss and spares muscle while dieting – key for great results. Stick with us and you’ll learn what to look for and which products are good (or bad) examples! Who Should Use Low-Calorie Protein Powder? 1. If you’re on a tight calorie-controlled diet. 2. Ketogenic or very-low-calorie dieters. 1. Less calories allows you to burn more fat. What makes the best low calorie protein shake? Diet protein powders are often marketed solely at women, but that’s just marketing. In reality, a protein powder with a high protein per calorie value is useful for everyone. If you’re counting every calorie, you don’t want to worry about your protein shake, too. Getting the most protein from the least calories gives you a little bit of “wiggle room” in your diet. This is also important because protein is the most filling source of calories, and helps you fend off hunger! This is a method of weight loss that uses a high protein diet with very few other calories. This is an accelerated method, used because it preserves muscle while you’re burning fat rapidly. A pure protein powder is a great help during these times, when every calorie counts. On a ketogenic diet, you want the protein without the carbs. Low calorie protein powders tend to trim the carbohydrates (especially sugars), so this is perfect. The versatility makes these supplements a perfect choice for existing dietary structures and rules. The goal of more protein per calorie is useful for everyone: you get to choose where your calories come from. Even if you’re looking to gain weight, a low-calorie protein powder gives you control over what other foods you’re consuming. You’d just need to mix or blend it with other high-calorie foods. This could mean high-fat coconut milk or a workout carb like dextrin. Whatever your fitness goals, a high-protein supplement means more protein for your money and more control over your diet. So, what can you get from a diet protein powder? This is because you can create and sustain a larger calorie deficit. Your body makes up the difference with bodyfat. The best low-calorie protein powders will have around 50 fewer calories than the regular counterpart. This can add up to just under half a pound of fat per month. This is a small amount, but it really adds up – especially if you’re having more than one shake per day! This is a great benefit. Protein is the most filling of all macronutrients – this means all the same fuel without being as hungry. You can stay full and reduce snacking on a weight-loss diet. A low-calorie protein powder provides the satiety you need without the calories. This helps you stick with that challenging diet, rather than snacking. Since the key to dieting is consistency, this is a massive benefit. Studies show that a high-protein diet already improves weight loss potential. This is key – a higher intake of protein is going to help you with your body goals. There are many reasons for this: reduced hunger, improved nutrient-partitioning, and the way your body processes proteins. The important part is that high-protein diets seem to work better than the “normal” alternative! With these great weight-loss benefits, you might think there’s no downside. However, this type of change means you have to adjust your practices elsewhere. The big problem here is that, by reducing carbs to cut calories, low calorie protein powders aren’t as effective for post-workout nutrition. We’ve discussed post-workout supplements before, where we said that a carb-protein mix was key. Obviously, this isn’t going to be so simple with a low-carb protein powder. If you’re trying to maintain or build muscle while you lose weight, you need to combine these shakes with carbs. This can be in the form of food, but you could also add a post-workout carb like cyclic dextrin. This isn’t a huge problem – we’ve already provided 2 solutions – but it does mean a little more effort. You’re in control of your diet with low calorie protein powders, but this means responsibility for the little things. There are a few factors we’re going to discuss – here’s why they’re important. This is what makes it a low-calorie protein powder! It’d be easy to call any product “diet” simply by reducing the serving size or cutting the protein content. This would reduce the calories, but you’d not get any real benefit from it. This is why protein per calorie is a better measure. A higher percentage here means a better product – you’re getting all the benefits without the calories. Keep in mind that protein has 4 calories per gram: there is a hard limit to how lean a protein powder can be! Often, supplement companies mark up their diet products. This makes value a crucial consideration for low-calorie protein powders: you don’t want to pay a big premium for a leaner product. We’ll discuss this in dollar-per-protein, but also overall cost for a standard product. You want to get the best price, as well as the best protein score! This is going to cover anything we haven’t predicted. This could mean pro-health compounds, better absorption, or other interesting facts. These often make the difference to the products we recommend. 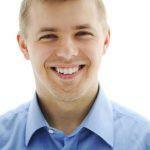 This goes for the good and the bad: anything that changes a product is going to be a key consideration for our reviews! With 100 calories from 22g of protein, Legion starts us off with an 88% protein-per-calorie content. This is a good place to start, though we’ll definitely see better options as we go along! The remaining calories come from a gram of fat and 2g of carbohydrates. These are relatively high, since they could easily be replaced with non-calorie sweeteners or natural, indigestible flavors. Overall, it’s a relatively low-calorie protein powder but it’s just a reduction in overall content. 22g of protein is relatively low compared to regular shakes on the market. The other ingredients in this product also don’t set the world on fire: the vitamin and mineral content is relatively unimpressive. 14% of your daily calcium is the largest nutrient content, which isn’t huge. This product is relatively lean, but without being particularly impressive as a low calorie protein supplement. This is another product that comes in with a sub-90% protein rate. This means that you’re getting around 87% protein per calorie. 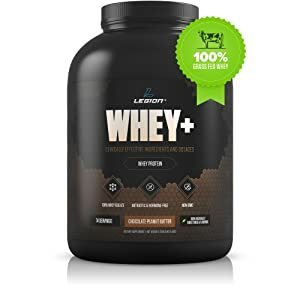 With a larger serving size of 39g and 140 calories, we’re not even sure that this counts as a lean whey protein powder. There are definitely many other products on the market that provide a better concentration of protein. This product also contains 3g of carbs per serving and 1g of fat. The vitamin and mineral content are even lower than Legion’s protein powder, too! Despite their reputation for excellence in the field of dietary supplements, optimum nutrition aren’t doing so well with this product! This works out to an enormous 94% protein per calorie. This isn’t the highest we’ve ever seen, but it does provide a far greater value than the compounds we’ve looked at before. Bulk Supplements is winning already. The content of fats and carbs are both under 1g. This is why we see such a lean product, and so much protein. The vitamin and mineral content still isn’t great, but there’s only so much space in a 30g serving! Overall, this is exactly what we expect from the “does what it says” attitude bulk supplements takes. 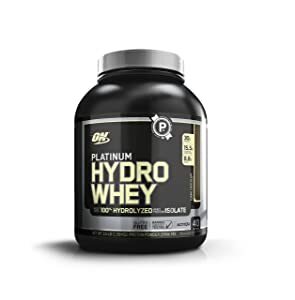 While Platinum Hydrowhey was around 86% protein, ON’s “Gold Standard” whey is a mere 80%. This is not an effective diet protein supplement – especially when compared to non-whey options. With over a gram of fat and 3g of carbohydrates to every 120-calorie serving, you’re missing out on some essentials. This is a whole 3g less protein than bulk supplements’ whey, and we continue to be disappointed with ON’s approach to protein-concentration! With 84% protein per calorie, NAKED sits somewhere in the middle of the pack. 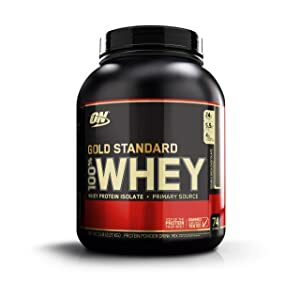 It’s less protein-rich than Optimum Nutrition’s HydroWhey, but more than gold-standard. Despite this, it still provides a decent 25g of protein per serving. The vitamin and mineral content is also stronger than both of those products, providing a small edge. 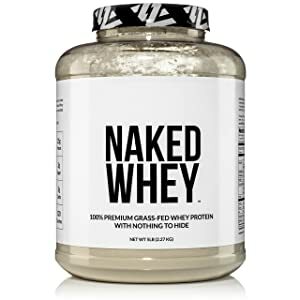 We’d like to see NAKED stick with their normally high-quality approach, but this just isn’t very effective as a diet whey. Around 1/6 of what you’re getting is not protein, which is just too much. We like that it’s a simple approach to whey protein, but it isn’t hitting our criteria very well! This product is what happens when you take NAKED’s whey and add 10 calories of filler. 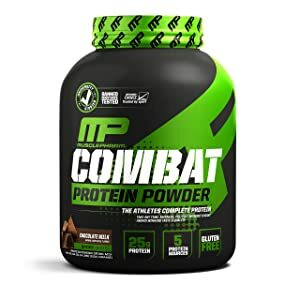 With a protein concentration of only 77%, this is one of the least effective low-calorie protein powders we’ve seen. Almost ¼ of this product isn’t protein. With a huge 5g of carbs per serving, and 1.5g of fats, there’s not much to recommend this product. It simply can’t compete with the others on this list. You might enjoy the taste because of the high fat- and sugar-content, but your body won’t. The gram of fiber is great but doesn’t make up for the lack of effective protein! The lowest protein per calorie on this list! Definitely NOT a diet whey! This is about as pure as protein powder can be. With a 100% protein per calorie rating, IsoPure has dominated the market and the competition. A serving is 31g, of which 25g are protein – but there are no carbs or fats in this product. This is the highest content we’ve seen in a whey protein isolate. It even rivals egg proteins. The vitamin and mineral content of this protein are clearly unmatched, too. This must be what the other 6g of your scoop provides! Vitamin and mineral content ranges all the way up to 250%, with an average nutrient density of 35-40%. IsoPure clearly hits all of our criteria, and is unequivocally the best lean whey protein powder on the market. There’s not even any competition: it’s 6% higher in protein-per-calorie than 2nd place! If you’re looking for a low calorie protein powder, this is the best. It’s a little pricey, but it provides the best diet protein powder on the market. The obvious downside to a product with 100% protein and no carbs or fats is the taste. We’ve also seen some complaints about a distinct protein-y taste but that’s inevitable with such a high-protein product. We think these are reasonable drawbacks for a product that is 100% pure protein! 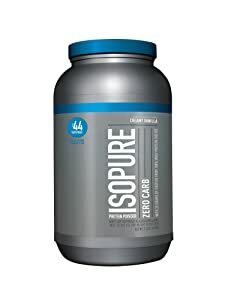 IsoPure is a clear winner, with a protein concentration of 100%. Obviously, nothing is going to beat this! The protein per serving is normal, while the remaining space in every scoop is packed with vitamins and minerals. For both weight-loss and health/wellbeing, IsoPure is head and shoulders above the rest. If you want to invest in a top-quality product, this is the one for you. 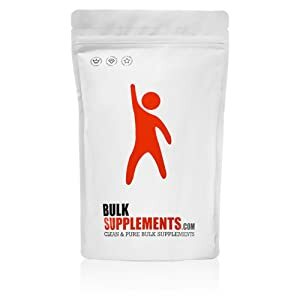 However, if you’re on a budget and need something lean and simple, Bulk Supplements is a strong second place. The 6% protein difference might not be a huge problem if you’re interested in saving a fistful of dollars. Purity comes with a price-tag! If you’re still not convinced, you can also find a variety of high-protein, low-calorie egg white protein powders on the market! With the variety of products we’ve reviewed here, there are some clear winners and losers. This isn’t how it normally works, but the difference between first and last place is enormous today! The market has yet to catch up with the benefits we’ve outlined above. There are some great products out there, but we’ve managed to cover some of the most popular and well-regarded brands on the market. If you’re looking to take total control of your diet or reduce your intake of junk with your protein, this guide is invaluable!